The first rule of choosing grass seed is to buy the highest quality that you can find on the shelf. While it will be a bit more expensive than the others, you are getting the most recent technology in breeding for disease resistance and appearance for your money. It is these qualities that you want to introduce into your existing lawn by overseeding. For spring planting in the North choose a blend of perennial ryegrasses. For fall overseeding you may want to match the type of grass you already have, so the lawn’s color and appearance will be uniform. In the North, however, your other choices look almost the same as Kentucky Bluegrass and there are some benefits to sowing more than one type of grass in your lawn. Every grass has particular fungal diseases to which it is susceptible. Combined, (Kentucky bluegrass and perennial ryegrass for example) they reduce the chances of losing major portions of the lawn to any one fungal disease problem. One grass may get a disease, but the other type will be immune and keep the lawn looking good. See the section in Helper Choosing Lawn Grass Seed. Estimate the size of your lawn in terms of 1000's of square feet and follow instructions on the package label. Recommended sowing of Kentucky bluegrass, for example, is 2 or 3 pounds for every 1000 square feet. At that rate it takes 20 to 25 pounds of seed for an 8000 square foot lawn. Kentucky bluegrass - 3 lb. Perennial ryegrass - 8 lb. Tall fescue - 8 lb. Fine fescue - 4 lb. Common Bermuda (hulled) - 2 lb. Many seed package labels prescribe one amount of seed for overseeding and another for brand new lawns. It is best to use the greater amount recommended for brand new lawns. Because yardeners do not have the luxury of time to water and care for newly sown seed that turf professionals have, the germination rate is likely to be lower. Using more seed than necessary compensates for some of the loss. When using a seeding device, divide the total amount of seed in half. Spread the entire area to be overseeded with the first half, and then go over it again in a different direction with the second half of the seed. That reduces the chances of missing any spots in the lawn with the new seed. If you are using Kentucky bluegrass, which is a very small, light seed, borrow a trick from turf professionals. Give the seed some heft by mixing it with another material, or "carrier," such as sawdust, sand, or fine vermiculite. While its certainly possible to sow grass seed by hand, with a hand seeder, the best way is to use a cyclone seeder. A (drop)spreader will also do the job but the rate the seed is released is more difficult to control. See Examples of Spreaders in Yardener's Tool Shed]].To sow by hand, take only an ounce or two of seed in your hand at a time and cast it in a semi-circular motion from side to side ahead of you as you walk over the lawn. Try to cover as much area as possible as evenly as possible. Walk over the area several times in different directions to assure even, overlapping coverage. It is important to insure that the seed is in contact with the soil. So the next step is to lightly rake over the lawn surface to bring the seed into contact with the top 1/8 inch of soil that has been loosened by the dethatching process. 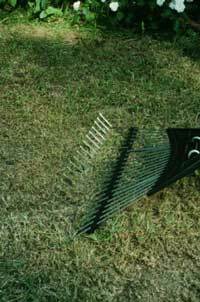 Using a garden rake for this purpose takes more time, but it gives seed better soil contact than a grass or leaf rake does. Ideally, only about 10% of the seed should remain visible with about 90% covered by loose soil. This is sufficient to protect the seed while it germinates, but to be on the safe side, you may prefer to take an extra step and topdress the overseeded lawn with a thin layer of organic material such as topsoil, compost, or similar product. Topdressing means to spread a thin layer (no more than ¼ inch) of topsoil, compost or peat moss over the turf that you have overseeded. An even covering about ¼ inch thick does not require much of the material, but there is enough to protect the new seed and help keep it moist. Some yardeners like to lightly tamp the topdressing over the new seeds by going over the area once with a lawn roller filled about 1/3 with water. For small lawns, simply walking on the topdressing does the trick. This slightly tamped soil will hold moisture near the seed longer. If you choose not to topdress your overseeded lawn, simply water more often to assure that the new seed does not dry out.